Obesity is on the rise, and not just for humans. Dogs are increasingly overweight and even obese. In the United States, an estimated 43 million dogs are overweight or obese - that’s over half of all dogs! And it is not just dogs in the United States that need to lose a few pounds - canine obesity is also a problem in Canada, Europe, Australia and other countries worldwide. Canine obesity increases the risk for osteoarthritis, insulin resistance, diabetes, high blood pressure, heart and respiratory problems, kidney disease, some types of cancer, and cranial cruciate ligament injury. Thanks to these increased health problems, overweight dogs face a decreased life expectancy of up to 2.5 years. Even if your dog is just a couple pounds over his ideal weight, those few pounds could make a big difference to your dog's health. For example, a 7lb Pomeranian is considered to be a “healthy” weight and the equivalent of a 145lb, 5’ 4” human female. An extra five pounds on the Pomeranian, however, is the equivalent to a 249lb female, which is more than 100lbs over the female’s ideal body weight. 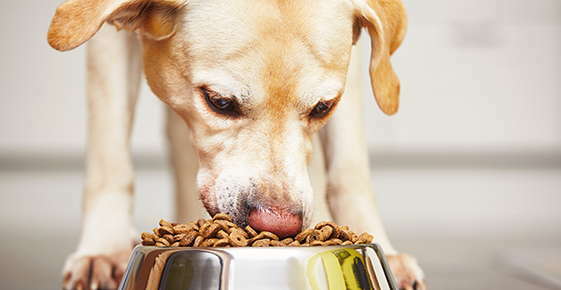 Just a few extra pounds really will make a big difference for your dog’s health. Why are so many dogs overweight? Unfortunately, some pet owners are literally killing their dogs with too much food and too many treats! For example, only one ounce of cheese for a 20 pound dog is the equivalent of 1.5 hamburgers for the average woman! While dog owners may never intentionally mean to hurt their pet, overfeeding, lack of exercise, and poor dietary choices have led to a pet obesity crisis. A lack of outdoor exercise is also a problem. Busy pet owners who work long hours simply don’t have the time to take their dog for longs walks, runs or play fetch. Together, too much food and a lack of exercise is the perfect recipe for dog obesity. Early intervention will help overweight dogs get healthy. Your veterinarian can recommend the right diet and exercise program to help your dog lose the extra pounds.